Our Skin has a pH too? Many claim that to restore healthy glowing skin, it is simply a matter of using the right skincare product. Have you ever wondered why or what really improves the skin at its core? Today, we are going to look a little deeper into the science of formulating bath products and what matters when it comes to choosing the ‘right’ bath or shower products for your baby’s eczema. People often say that our skin is naturally ‘slightly acidic’. Surprised? How can a solid skin has a pH? Our skin has a thin, protective layer on its surface that is known as the Stratum Corneum. The acidity of the skin (i.e. skin pH) actually measures the combination of sebum and sweat that forms a film over the Stratum Corneum known as the acid mantle. Acid mantle on our outermost skin layer acts as its natural immunity and fight off bacteria and germs. 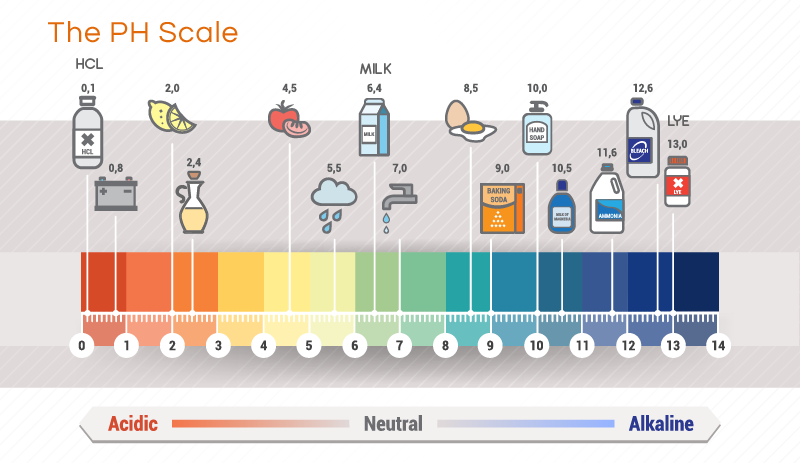 On a scale of 0-14, with pH 0-1 being the most acidic to pH 14 being the most alkaline. pH 7 is a neutral reading. The pH of normal skin is slightly acidic and ranges from 4 to 6.5. Either extreme pH levels – too acidic or too alkaline – are harmful and irritating for the skin; and drastic and long-term disruption to the normal skin pH will compromise the protective barrier of the skin. It becomes less resilient and more sensitive to environmental triggers. As it tends to also lose water easily, the skin of our baby and child will become dry and easily susceptible to infections and irritation. Children have a proportionally larger body surface area than adults. It means that they are at a higher risk of excessive loss of water. Thinner skin in children are also under-keratinized. Therefore, they are more quickly affected by absorption of toxins, chemicals or allergens through their skin. Their skin hardly produces any sebum before puberty. Moreover, the acid mantle of a baby, which is a defense mechanism against harmful microorganisms on the skin, is immature and liable to break down during childhood. As such, keeping the skin in good pH balance is essential for typical baby skin which is sensitive. What’s more, the level of care and importance of choosing the right product to use on baby with eczema makes even more sense! What bath products should I use or not use for bathing my child with eczema? Obviously, pH of the bath products will be one of the key factors in your consideration. Our acid mantle is protective at pH4.7 therefore we aim for products with a pH value between 4.5 to 5.5 which helps to maintain an optimal pH and promote formation of the natural acid mantle that is essential for the delicate skin health of our baby. You will not normally find pH value on product’s label but look out for keyword such as “pH balanced” – it means that the product is formulated with optimal pH for the skin! A rule of thumb, you can hardly go wrong with using special baby care products that are compatible with the delicate skin suitable for our sensitive babies. They are formulated to be very mild in terms of cleansing ability that does not strip natural oils. Its pH will also likely be supportive of a healthy acid mantle. By nature, soap bars are alkaline, typically around range of pH9 to pH10; which is why dermatologists advise against using soap bars on babies or young children. 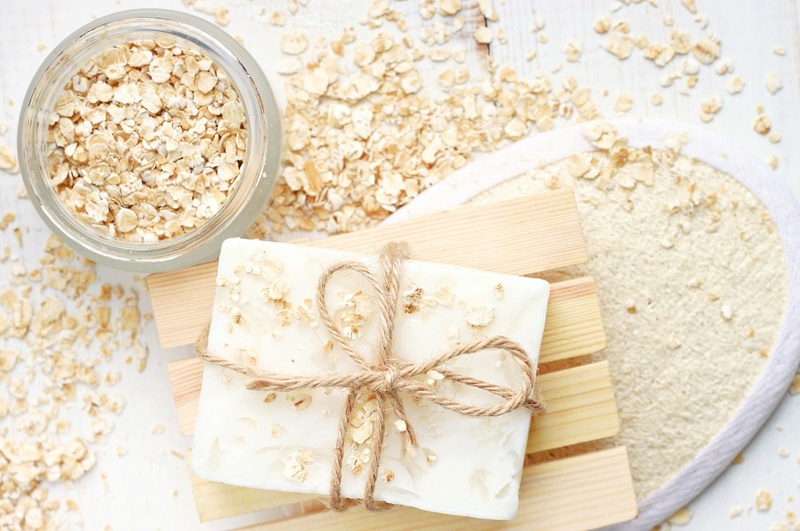 This is also a topic of controversy among many parents and there are various arguments for and against using natural soap bars on the skin of baby or child with eczema. Natural soap bars here refer to those that are produced using natural fats with the traditional cold-process method. We will discuss in detail on this topic in the future. Here is our take on this controversy: Bathing is an action that cleanses. Regardless of the products used – be it natural soap bars or not – they will alter the skin pH or strip the natural oils to a certain extent. Even normal tap water (with a pH of 7) can disrupt the acid mantle temporarily. But, in most ‘healthy skin’, the skin will begin to regain its acid mantle within 15 to 30 minutes after bathing. Therefore, in normal healthy skin, we do not foresee any potential risk using natural soap bars. In fact, a superfatted cold process soap bars are very nourishing and moisturizing. With eczema skin, in particular a baby or child skin, the acid mantle is immature, lacking certain lipids and furthermore, with a defective skin barrier inherent in eczema skin, we are not convinced that their skin is capable of restoring its homeostasis as a normal adult skin does. Until further studies had been performed and revealed results to the contrary, we prefer to take a more conservative approach towards our bathing regimen for babies and children. In Don’t Underestimate Special Bath Therapies for Eczema, bath soaks will take central stage. There are many effective and therapeutic bath treatments that work wonderfully for a child’s eczema. Because they are not well-understood, parents are confused about how they should incorporate these baths into their child’s bathing routine. Hence, they are missing out the many benefits of a bath soak therapy in restoring a happy, healthy skin. This entry was posted in Baby Eczema, Eczema & Bathing, Eczema & Dermatitis and tagged bath products for babies, eczema bath products, keywords when buying eczema bath products, natural soap bar for eczema, pH-balanced bath products for eczema, skin acid mantle, skin pH.